Imagine Powerman 5000, Rob Zombie or even Sevendust but with a Biblical message. 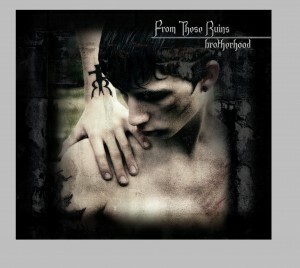 If you do that you might come close to what you have in From These Ruins debut album, Brotherhood. These guys aren’t famous but if they keep releasing music like this it won’t be long until they are. I could tell just by the first few songs. “Biblicon” has the sound of “Drop the Bombshell” by Powerman 5000, which, to me, is a great thing as it has some good solid Christian lyrics. In fact, the entire album has that industrial rock sound you would get from Rob Zombie or Sevendust. That alone would make this a winner for me, but to have a Christian message makes it even better. Then you have the title track, “Brotherhood,” a song that takes you by surprise as it starts out soft and then blows your ear drums out of the water like an underwater bomb. “Crush the Devil” might be one of my personal favorites. This one pretty much sums up the entire album. It’s hard, heavy, and biblically strong in the message; the message and tone combined take you out of your seat, give you a nice, strong dose of Jesus-metal- straight to the heart. From These Ruins is definitely on to something in Brotherhood. If they keep this up, there’s no telling what they’re capable of doing. They are an upcoming force to be reckoned with. Keep your eyes out for this Indiana-based force of metal- they won’t let you down.